If you are looking to get your first email address setup in cPanel, we will show you how to in this guide! Having an email address at your own Domain is always important. Once you have logged into cPanel look for the ‘Email‘ section and click on Email Accounts. Once you have clicked Email Accounts you will be given an empty form like below to fill out. The form is quite straight forward so no technical knowledge is required luckily, it pretty much explains itself – Just enter the email account name you want just the first section, so if you wanted say ‘hostox@hostox.co.uk’ you would just enter ‘hostox’ after that just enter or generate a password and click ‘create account‘. Once done you will see ‘account created‘, you will also see it listed like the below image. From here you can update the Password, setup your email client, delete the account and change the disk allowance of the email account. 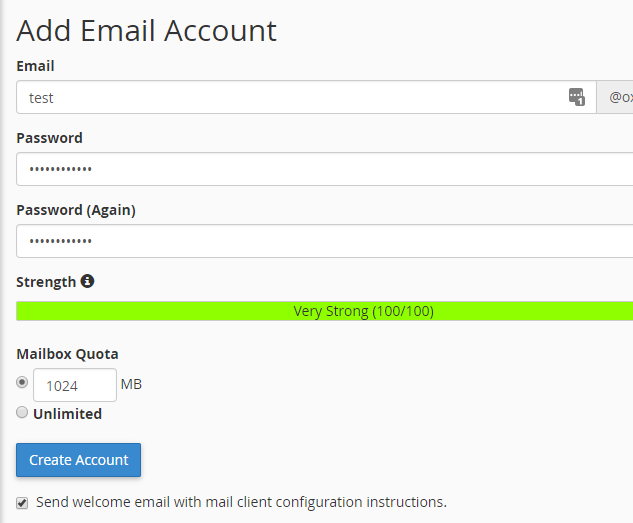 This entry was posted in cPanel and tagged cpanel email hosting, create email account cpanel.